It has been an eventful last 48 hours to say the least. I was up for 30+ hours of them so I would know. Haha. Why I haven’t started drinking coffee yet I may never know. We have been extraordinarily busy today and by we I mean my division and I specifically. Two nights ago we had a scenario and it was 10 hours long and it didn’t start till midnight. I had the watch before that, so I was already an unhappy camper coming into it and my mood only got worse. At 1900 the next evening when I was still awake and had barely sat down for 5 sec. and had missed two meals, pretty much everyone commented on how ridiculous I was acting. I just chalked it up to series of unfortunate circumstances. We’ve been doing a lot shiptastics lately (that’s a combination of ships + gymnastics AKA DIVTACS). That’s basically when all the ships in the formation are steaming along and then a signal is given for example–> all ships form into a straight line with 2,000 yard spacing, it will say execute to follow and we take a few minutes to prepare and then they will say standby, execute and all of the ships in the formation move to their specific position promulgated by the signal. Overall it looks pretty cool because we make formations such as diamonds and columns and reverse the order, but it is also very stressful because you are in close vicinity with 4 other ships and the captain comes to the bridge and normally yells a lot. Well I had been so exhausted from not sleeping that I kind of slept through that training a little bit since there’s like 15 ensigns on board I thought it would be okay if I wasn’t up there for the beginning. That did not go over very well because when I did come to the bridge I got yelled at. 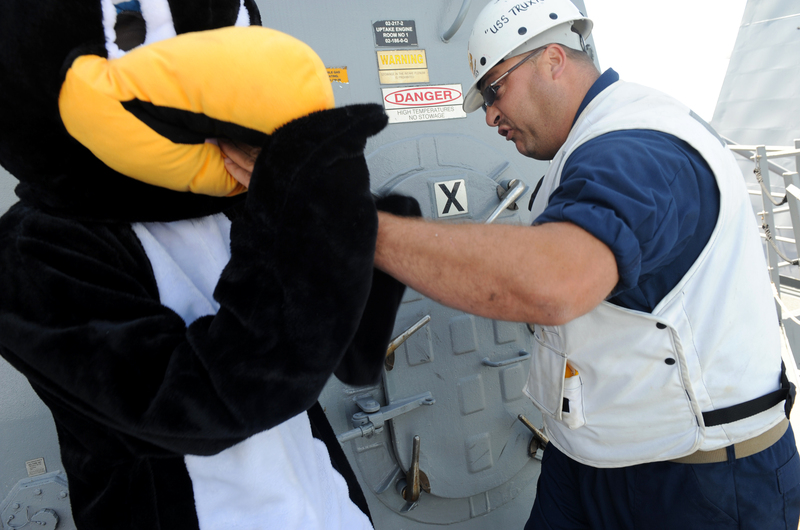 Later, at the underway replenishment brief [under way replenishment is when you come alongside another ship, normally an oilier and take on fuel] I was dismayed to find my name on the watch bill under the dancing penguin. 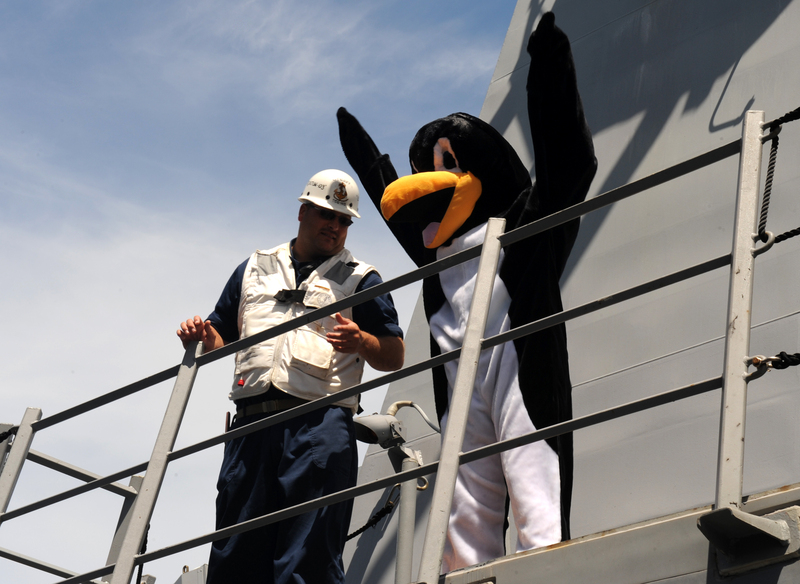 One of the ensign’s had told his mom about having the mascot as a penguin and she loved the idea and went and bought him a full body penguin suit to wear around. 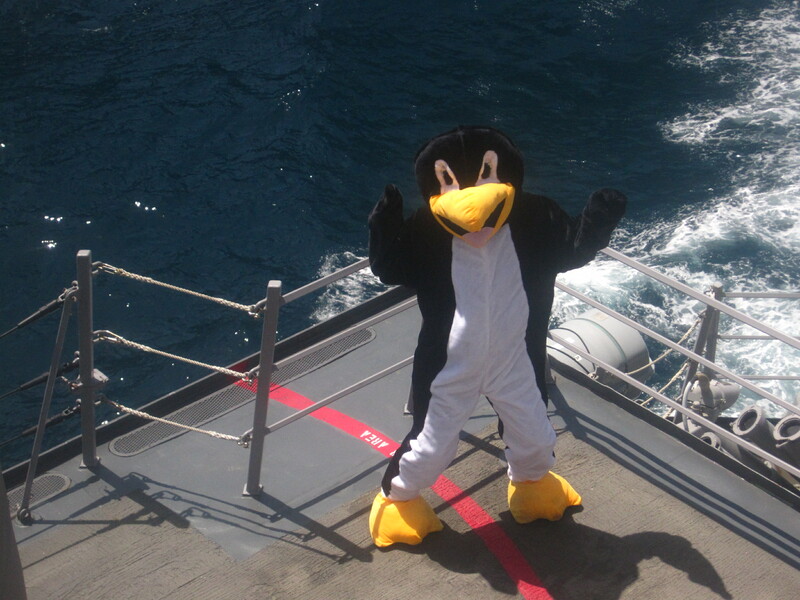 During underway replenishment’s when you are coming alongside the oiler the tradition [that just started since our deployment] is that the penguin will go outside and dance his little heart out as we pull up to the other ship and he will dance again, we break away. Since J brought the penguin suit he was the first one to wear it last week. And my did he make me laugh. He was out there doing all kinds of crazy things such as pretending to lay eggs and then throw them at people and “making it rain” if you know that term. It was pretty funny. in the penguin suit. They were loving it. I also danced the entire time which was two and half hours, so I brought this thing to a whole new level. I even busted out my signature move and that is the shopping cart, with my personal twist. People were practically rolling on the ground in laughter. When we came alongside the oiler I ran out to the Forecastle which is the forward most part of the ship and danced right behind the line of people out there standing in ranks. Overall I consider it to be a huge success. Today we brought 6 Spanish officers on board and they are staying for a few days kind of like when I went to the Japanese ship and stayed with them for a day. We have a few on board and they actually do speak Spanish so the barrier is not so thick and they already seem to be enjoying themselves. The foreigners love our ships and I’m pretty sure that its because we have ice cream on board. [Well at least what the pilots haven’t totally demolished yet. urgh. ha!]. We are currently 5 hours ahead of the east coast, so I am quite exhausted. 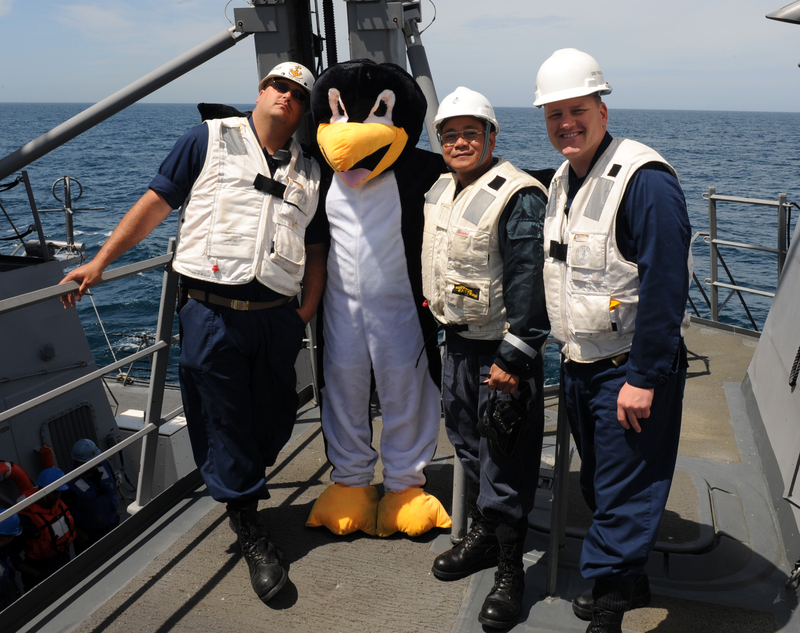 This entry was posted in My First Deployment, NAVY and tagged dancing penguin, high seas, penguin, ships, The Seven Seas, the world, travel by Cassey. Bookmark the permalink.